You are here: Home / RV Gadgets and Gizmos / Do You Trust Your RV GPS To Get You There Safely? Do You Trust Your RV GPS To Get You There Safely? Every few weeks another “Death by GPS” fatality makes news headlines. From the dozens of Death Valley tourists who make fatal turns down long-closed mining roads to anglers who make a wrong turn into the forest, more careless drivers are finding themselves in scary, sometimes fatal predicaments. 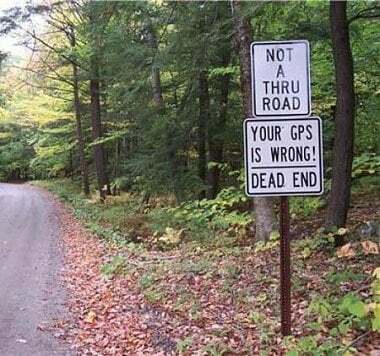 Is your RV GPS leading you down a dead end? Think it can’t happen to you? Even experienced RVers who rely on their GPS device to help them navigate around low clearance bridges or hairpin mountain turns are finding that the devices aren’t always what they’re cracked up to be. Our Garmin 760 RV GPS took us on a country tour that turned into a very narrow road with a hair pin turn that we could not make without disconnecting the tow car. After that with the car still disconnected I encountered another 180 degree hair pin turn that had me wedged in the turn on a very steep down hill in the rain, after pulling up and backing several times at only a few inches at a time I managed to get free. Not before denting and scratching the bottom of my rear lower panel on the Bus. Fortunately no bad damage, but after unhooking I neglected to wrap my cables because I was blocking the road and by the time I got to a highway where I could hook up the car, my brake air line was destroyed and my wiring harness is damaged, that I can splice until we get home. The air line I will visit a auto parts store and replace. I have a definite love HATE relationship with the GPS, it has screwed me before but not this bad. Earlier on this trip it told me to take a right turn then left and then navigate OFF ROAD, this was a dead end road. Beware of the GPS. Don’t hold the device while driving. In every U.S. state you can be ticketed under a “distracted driving” infraction for just holding a GPS device while driving. Always program the device before your departure. If you need to mess with it, pull over. Do not mount the GPS on your windshield. A recent Consumer Reports article says that the GPS enthusiast website GPStracklog reports that mounting a device like a phone or GPS on a windshield—including using the mount made for your device—is illegal in 28 states! Don’t rely on it as your only navigation tool. GPS is a convenience tool and like anything it’s not 100% foolproof. Consequently, only fools rely on their GPS when navigating unfamiliar terrain. The iRV2 Discussion Forums have dozens of informative posts about which RVs are best for RVs. Be sure to check them out if you’re thinking of buying one or just want some insight from other RVers who have gotten into tight spots thanks to modern technology. Everyone who travels or RV’s should learn how to READ a MAP! It isn’t difficult, but for some it’s an impossible task. Do Not depend on a GPS as your soul navigation device! 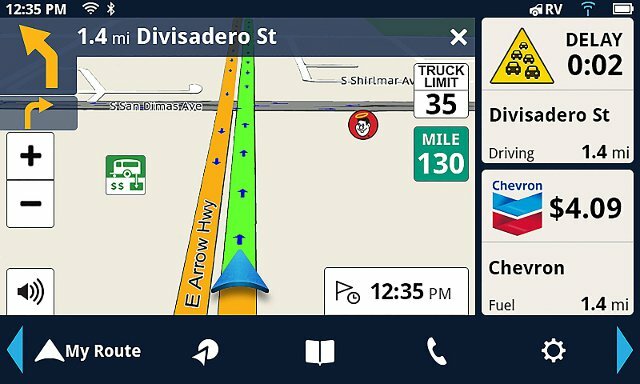 Those who experience costly or, especially, hazardous navigation errors, should consult with a lawyer about suing GPS manufacturers for financial compensation for health and/or life-threatening consumer endangerment. Sadly, many of these manufacturers must be aware that the map data they purchase and use are outdated and potentially dangerous but have no financial incentive to ensure the safety of the information and guidance they sell with their systems. They need to be convinced by hitting them where THEY hurt: in their bottomline… Only then will they demand clean map data from their suppliers. Yep, you can’t trust them. One of ours told us to “drive to the prison” after we changed our minds on where we were going and ignored its directions, its taken us to a juvenile facility instead of the storage facility we were looking for and the one in our new car tells us to “make an illegal (right or left) turn.” The one in the motorhome has sent us on narrow, curvy snowy mountain roads and way out of the way when there were other, much more efficient and less snowy ways to go. But we found out too late to make a difference in those trips. We have learned to consult paper maps, and if you know for sure where you are going, but the GPS wants to you go another way, ignore it! As full-time RVers, we quickly learn the limitations of GPS units. They’re only as good as the data therein. GPS manufacturers need to harness the input of their users to improve the data quality. The GPS is a delight to use to approximate time of arrival and services en route but, they don’t replace your eyes and your own situational bearings. We had a problem using our GPS in central Oregon. Fortunately we were in our tow vehicle instead of towing it. We were heading East and then North to go to Crater Lake. There was a road that cut the corner and appeared to cut quite a bit off the drive. When we got to the East bound highway, we discovered that the State or county had put a locked gat across the “shortcut” so you couldn’t get onto the highway. It had been a very beautiful drive but the 45 minute backtrack wasn’t as much fun. We noticed 2 rv’s with towed vehicles trying to get turned around . In parking lots on our way out. We were glad we weren’t doing the same thing. It doesn’t seem possible that the map data suppliers could possibly drive every bit of every road to verify physically, and consequently satellite data is used. I’ve seen this myself with roads shown on satellite image maps on my computer or phone where the map shows a road continuing on what is obviously a path. I’ve had to reroute several times when a road isn’t where the GPS says it is, and when checking later, the satellite images show a road on each side of a wooded section where the mapping algorithms assumed it went through. Thankfully I was in a car both times, and other than a loss of time and plenty of frustration, but no harm done. Another thing that could help is satellite images with contour lines overlayed. This would help with reading how steep a hill is. I always check a new to me GPS by using it locally before a trip to see what “quirks” it may have while I’m on local roads I know. Helps to understand the GPS a bit better. What commission do you suppose they get from RV Trip Wizard?